One of the (many) great things about visiting a bookshop for the first time is knowing you're meeting a new friend. You don't yet know what they're like; whether you'll share love stories or set the world to rights; or even if they'll become a regular part of your life or a rare treat to be appreciated, but however the friendship develops you do know that bookshop will be there for you. It will offer you a safe place, a friendly smile and – with a little time and patience – the answer to all of life's problems. What's less expected when I enter a new-to-me bookshop is that it will also remind me of an old friend. Because no matter how many standard elements bookshops share (shelves, books, booksellers, etc) we can all agree each bookshop is unique. I'm not saying Ken Spelman Books in York isn't unique, just that an element of it reminded me of a much-loved bookshop that is no more. It was like putting on a new jumper and realising it fits just as well as a holey, old favourite, only much classier and in a completely different league. I never did pretend to be any good at similes. Found just beyond one of York's many 'gates', Ken Spelman Books is a secondhand and antiquarian bookshop with a distinguished exterior. Where the word antiquarian could put off poorer browsers (ie me) this bookshop is cleverly laid out, with a discount stand outside the door and a wall of paperback fiction inside. 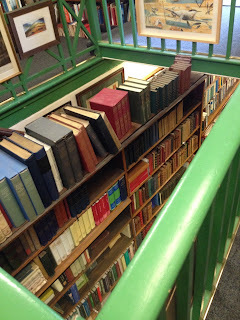 With such temptations by the entrance the only natural thing to do is continue exploring inside – to a recommends table of reduced price fiction and non-fiction, all with helpful paper banners introducing their contents to browsers. Dark wood fittings balance out the brightness of the books, many of which appeared to be new, and the overall feel of the bookshop was that of a sophisticated period library, and one very much worth exploring. Heading to the back, a short wooden ladder to access the top shelves triggered the feeling of familiarity I mentioned earlier. The feeling intensified as I made my way upstairs, finally prompting a rush of happy memories as I looked over the bannister to the floor below. Granted, Ken Spelman Books is much smarter and more spacious than the old incarnation of Hall's I was remembering, but anyone who's loved and lost something must know how lovely it is to glimpse a memory of that loss in a living, current experience. Re-living the memory, and enjoying another bookshop with an historic feel, meant I fell in love with this bookshop not only for its friendly atmosphere, gentle busyness and great selection of books, but also for its nod towards the historic. From the York setting to the warm, gentleman's library decor, to the happy reminder of a bookshop past, Ken Spelman Books is to be appreciated as much for its stock as for what it is. We can't return to the past, but we can celebrate it in the modern world. We can also remember it with mementoes to take home. In this instance A Passage to India by E M Forster and a conveniently spotted birthday card for a friend.